The US is considering abstaining from a possible UN Security Council resolution against Israeli settlements in East Jerusalem, sources suggest to the BBC. 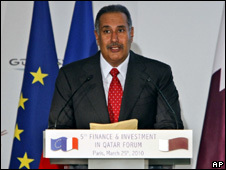 The possibility surfaced at talks in Paris last week between a senior US official and Qatar's foreign minister. The official said the US would "seriously consider abstaining" if the issue of Israeli settlements was put to the vote, a diplomat told the BBC. US officials in Washington have not confirmed the report. There are no concrete plans at present to table such a resolution at the UN by any state. But it is likely that the US is considering how to maintain pressure says BBC state department correspondent Kim Ghattas. The US usually blocks Security Council resolutions criticising Israel. But relations between the allies have been severely strained by the announcement of plans to build 1,600 homes in an East Jerusalem settlement during a recent visit to Israel by US Vice-President Joe Biden. The move prompted the Palestinians to pull out of the US-brokered indirect "proximity talks" that had only just been agreed in a bid to revive the peace process, which has been stalled for more than a year. 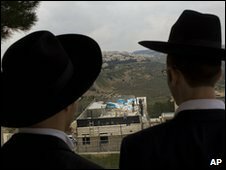 Nearly half a million Jews live in more than 100 settlements built since Israel's 1967 occupation of the West Bank and East Jerusalem. They are held to be illegal under international law, although Israel disputes this. The reported exchange between the US official and Qatar's foreign minister came to light during a meeting at an Arab League summit in the Libyan town of Sirte. A diplomatic source told the BBC that Qatar's Foreign Minister, Sheikh Hamad Bin Jasim Al Thani - who is also the prime minister - had recently met an official high up in the Obama administration during a visit to France. During their talks, Sheikh Hamad asked the US official whether Washington would guarantee not to veto a UN Security Council resolution that was critical of Israel's ongoing settlement construction in East Jerusalem. The diplomat said the US official had replied that the current feeling in Washington was that they would "seriously consider abstention". An Egyptian official is said to have confirmed his knowledge of the US position during a meeting at the Arab League summit, which was held behind closed doors. The US Middle East envoy, George Mitchell, was in Paris last week to hold talks with Israeli Prime minister Benjamin Netanyahu and the Palestinian Authority President, Mahmoud Abbas. The US is one of five permanent members of the Security Council with veto power and has a history of blocking any resolution condemning Israel. The BBC's Rana Jawad, in Sirte, says that many people will see the comments as yet another sign of Washington's recent dispute with Israel. In November, Israel announced a 10-month suspension of new building in the West Bank. But it considers areas within the Jerusalem municipality as its territory and thus not subject to the restrictions.